Over the past month, I have been testing the Bribar Allround Professional table tennis bat (cost £54.99). This bat is aimed towards intermediate players and has an impressive reputation. But what is it really like to play with? Is it easy to do topspins, drives, pushes and blocks? In this review, I share my experience of playing with the Bribar Allround Professional table tennis bat, consider how it compares with other bats and suggest who the bat is most suitable for. The rubbers for both forehand and backhand are JOOLA Zack. These are good quality German-made rubbers which have plenty of control but also some extra gears to play fast and spinny shots. The blade is a JOOLA Falcon Medium. This is a light-weight all-wood blade, which like the rubbers, offers lots of control. The bat is custom-made which means it has been put together by a staff member at Bribar, rather than factory produced. So it is easy to change or replace rubbers when you need to and keep the blade. I was pleasantly surprised with the topspin qualities of this bat. I found it very easy to grip the ball and get lots of topspin. You can get a nice arc over the net and the spin kicks off the table nicely. I have a player I coach who was using a Palio Master bat. He switched to the Bribar Allround Professional and the consistency of his topspin shots improved instantly. The superior rubber quality made it far easier for him to grip the ball and generate more topspin. When the ball is a little high and I want to hit through it, rather than spin, I am able to get plenty of speed on my shots. Because the rubbers and blade are not super-fast, I never felt I was in danger of over hitting. So it’s a solid bat for hitting the ball with good accuracy and consistency. Pushing is pretty good too. To get the most from the bat, you need to have decent pushing technique. If I pushed a little too passively, I found than ball would go too high over the net. But if I properly brushed under the ball when pushing, then I could get lots of backspin and keep the ball really low over the net. One of my favourite things about this bat is how easy it is to block with. I could really absorb a lot of incoming spin and block the ball back low and keep the ball on the table. I was able to do all my usual serves pretty well with this bat – lots of spin and placement control. I wasn’t able to get quite the same level of spin as my usual bat (JOOLA Fever blade / JOOLA Rhyzer rubbers), but it wasn’t that far off. When returning serves, I found there was a nice balance between being able to control incoming spin, but also generating my own spin when I needed to. If you are currently using a cheap bat with fairly dead rubbers, you may find the Bribar Allround Professional more ‘lively’ when returning serves. But in the long term, this will be a good thing, as you will have to develop your technique, rather than relying on a dead bat, to return serves. How does it compare to other bats? For me, the Bribar Allround Professional is a step up compared to beginner table tennis bats. It has more speed, more spin, but crucially still has enough control so that you can keep the ball on the table. The cost is higher (£54.99) compared to beginner bats (typically £20-40), but you get get better quality rubbers and blade. It’s not as fast and spinny as the high end table tennis equipment, but it does have similar playing characteristics. So it’s a nice table tennis bat to use when you want to progress from a beginner bat, but not quite ready for the really fast and spinny rubbers and blades. Who is the bat suitable for? If you’ve reached (or are heading towards) an intermediate standard, then this really is a very good table tennis bat for you to buy. When I’m coaching and give players a few bats to try out, this is usually what they choose to play with. It just has that nice all-round balance which makes it easy to play with, but has a few extra gears to play fast and spinny shots. I think the Bribar Allround Professional is also suitable for a more experienced player who has a steady, all-round game. The sort of player who likes to mix up play with some topspin, some drives, some pushes and some blocks. This bat does a little bit of everything pretty well. I think the Bribar Allround Professional is an excellent choice for an intermediate player. The price is very good. If you buy the bat complete, you save quite a bit of money compared to if you buy the rubbers and blade separately. And from my testing so far, and other reviews I have read, the rubbers are really quite durable. You should get lots of use out of them before they need replacing. 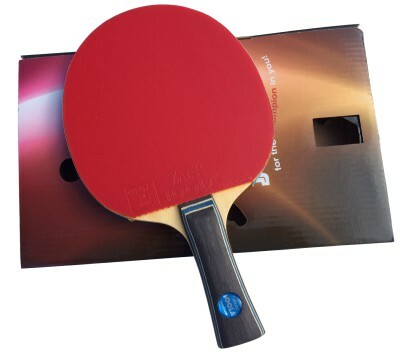 So if you have been playing table tennis for a while and you want to upgrade to a better quality bat – something which will give you more speed and spin, whilst being easy to control – the Bribar Allround Professional is an ideal choice for you. The Bribar Allround Professional is available to buy in the UK from the Bribar website or Amazon UK for £54.99. On the Bribar page for this bat, they give some options related to handle shape and to thickness of rubber for forehand and backhand sides of the bat. Could you comment on these options and what are good choices (and why) for beginner / intermediate players. Hi John – if you want a bit more speed and spin then you should go for the thicker sponge. If you want a bit more control, then go for the thinner sponge. Or you could mix and match, e.g. a thicker sponge on one side and a thinner sponge on the other side. Beginners may benefit from the thinner rubbers, as it will be easier to control incoming spin. Intermediate players may benefit form a thicker sponge, so they can generate more speed and spin. For handle, it really is personal choice. If it doubt, I’d go for a flared handle as for most players it sits in the hand quite comfortably. Hi Michael… for me I am able to generate more spin with the Bribar Allround Professional compared to Palio Master and Legend. It has similar control to Palio Master and is easier to control than Palio Legend. It is a little bit faster than Palio Master, but a little bit slower than Palio Legend. The blade quality is higher and the rubbers more durable than both Palio Master and Legend. The Bribar Allround Prefossional is very good for allround play, mixing up attack and defence.